Tommy Chatman made two free throws, the only points in the final extra session, to give the top-seeded Pirates a 57-55 victory. 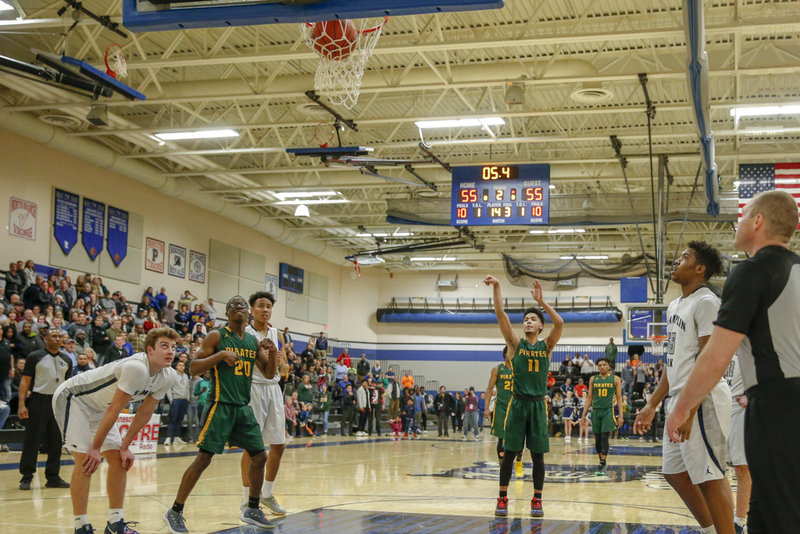 Senior guard Tommy Chatman drove to the basket, drew a foul and made both free throws with 5.4 seconds left in the third overtime Friday, setting up Park Center for a 57-55 victory in the Class 4A, Section 5 championship game at Rogers. Champlin Park had one more chance, but senior guard Bennett Otto’s buzzer-beater was no good. “Down the stretch I just give our team a lot of credit. We got two or three stops in overtime. That was the difference,” Park Center coach James Ware said. With one second left in the second half, Otto’s potential game-winning shot banked off the rim as the buzzer sounded, sending the game into overtime tied 43-43. Champlin Park (23-6) got 14 points from senior guard Jacob Johnson. Park Center (28-1) was led by junior forward Dain Dainja with 15 points, including nine in overtime. The victory sends Park Center to its first state appearance since placing second in 2013. Park Center lost to Osseo in the section final last season. “I strictly told [Dainja], ‘Remember that feeling last year when we lost to Osseo?’ He told me, ‘Yes.’ I said, ‘We’re not feeling like that again,’ ” junior forward Detavious Frierson said. Park Center defeated Champlin Park 71-54 in the regular season. “The big change is the section finals. Anything goes, and it’s really tough to get to the state tournament,” Champlin Park coach Mark Tuchscherer said. After Park Center waited out most of the third overtime, senior guard Tommy Chatman drove to the basket in the final seconds and drew a foul. He made both free throws to give his team a 57-55 lead with 5.4 seconds left. Champlin Park had one last chance. Senior guard Bennett Otto shot a buzzer-beater in the final moment, but it was no good. 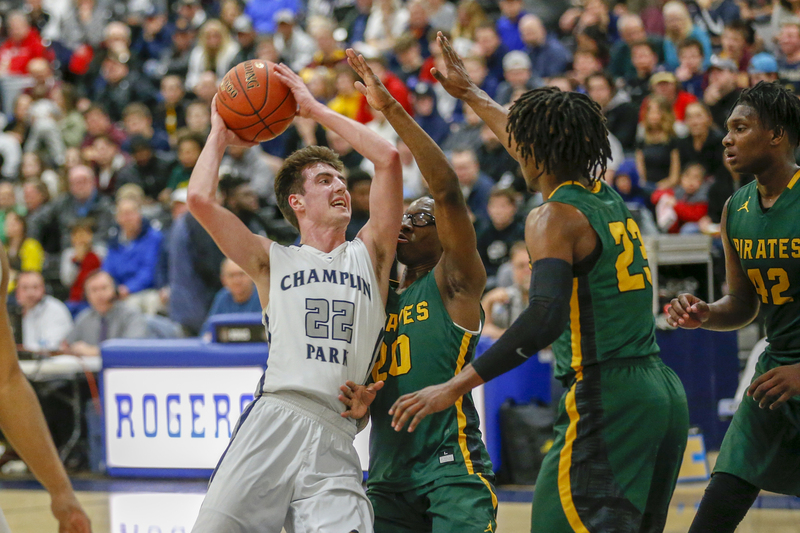 giving top seed Park Center (28-1) the victory over Champlin Park (23-6) at Rogers High School on Friday in the Class 4A, Section 5 championship game. In the final seconds of the second overtime, Park Center senior guard Emmanuel Tamba drove to the basket, got stuffed and a jump ball was called. Champlin Park got the ball to Otto, whose shot just before the buzzer banked off the rim. Chatman's two points were the only points scored in the third overtime, and it was all the Pirates needed. With 1 second left in the second half, Otto had a shot for the win but it banked off the rim as the buzzer sounded,. sending the game went into overtime tied 43-43. Park Center’s Emmanuel Tamba hit one of two free throws in the final 6.6 seconds of the first overtime to send the game into another 4 minute period. Park Center junior forward Dain Dainja led his team with 15 points. Champlin Park senior guard Jacob Johnson led with 14 points. Champlin Park held a 31-27 lead going into halftime after Johnson ran out the clock and scored on a jumper in the final seconds of the first. Johnson led his team with 7 points in the first half. The Rebels held a 26-18 lead in the final 3 minutes, but Park Center went on a nine-point scoring run after a timeout. Park Center defeated Champlin Park 71-54 in their only meeting of the regular season. The victory sends Park Center to its first state appearance since placing second in 2013. It will be the school’s fourth trip to state.